New Buffy or Angel figures don't come out too often (ignoring variations), but as usual, when it rains it pours. Just a couple weeks ago I reviewed the first Angel assortment with Angel, Cordy and Faith. 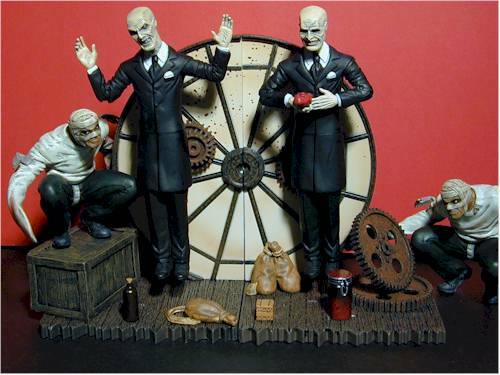 This week it's the fourth series in the Buffy line, including Drusilla, and two distinctly different Gentlemen. Drusilla is of course the vampire girlfriend of Spike, but things are more complicated than that. One of Angelus' victims, she's clearly not stable, even ignoring the basic mental instability just from being a vampire. This first version is the 'normal' look, while a later exclusive will have her vampire face. 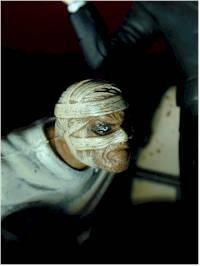 The Gentlemen were the antagonists of one of the most unique Buffy episodes, 'Hush', in which the actors didn't speak for 40 minutes of the show. Not only was the episode unique, but it was well written, and the Gentlemen were decidedly spooky villains, well received by the fans of the show. Same stuff, yadda, yadda, yadda. I do like the actor photos they use, particularly on the front, but the photos of the other figures in the line are pretty uninspiring. 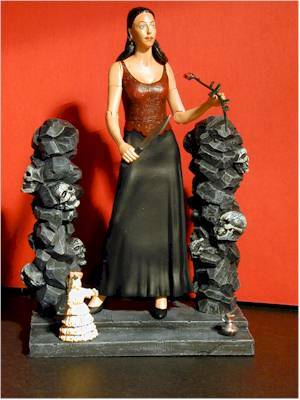 Drusilla comes with four small accessories, including a knife, rose, silver cup, and her doll, Miss Edith. She also comes with an excellent display base, one of the finest produced so far. All her accessories are nicely done, although the soft plastic of the knife and rose hurts the score a little. But the real standout here is the excellent base, another major improvement over previous Buffy lines. The bases were pretty good with series 2 and 3, but these bases are another step forward. 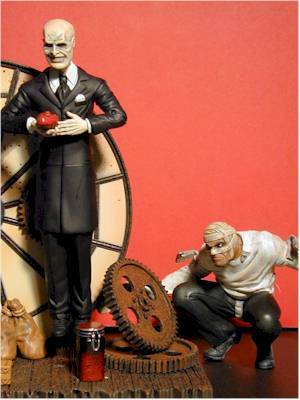 The Gentlemen also have excellent bases, and theirs are designed to sit together and form an overall base re-creating the clock works in the tower where they had their final battle with Buffy and Riley. The detail work on these bases is absolutely fantastic, with excellent sculpting and great paint ops. 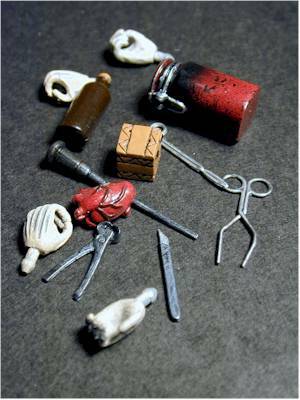 The two Gents also come with a variety of accessories - scalpel, surgical tools, heart, bottle, vial that was used to hold the heart, small decorative box (that held the key to their defeat), and an extra set of hands for each. 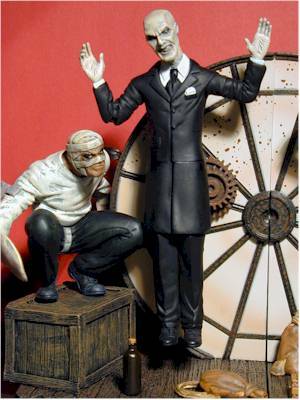 Each Gentlemen also comes with a henchman dressed in a straight jacket. These henchmen aren't articulated, but have bendy arms. While Dru's accessories are nice, the addition of the henchman and the fantastic base with the Gentlemen set them apart from every previous Buffy release to date. The sculpt on Drusilla is a big disappointment for me. The actress that plays Dru, Juliet Landau (daughter of Martin Landau), is a very attractive woman. The woman portrayed here is simply plain. It may be due to the smoothness of these recent facial sculpts, but there's really no character to this version, and she even appears misshapen from certain angles. The nose is crooked, and the sculpting around the ears and neck was left rough. The sculpt on her body is better, particularly her blouse. There's a lot of detail there, and the pose is well done. The Gentlemen are another story. Both figures use the same body, but each has a slightly unique head sculpt. And what an excellent head sculpt it is! These characters are right on, and the detail is fantastic. The paint ops on Dru don't help the weak sculpt. Her lipstick is applied unevenly, and the hair line is not clean. Again, the Gents are a complete opposite. The paint ops are great, and the solid black suits show no variation or sloppiness. The face details are great, particularly the spooky eyes. 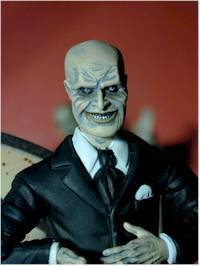 The articulation on the Gentlemen or Drusilla are as good as some of the other, newer Buffy/Angel series. Both are statues from the waist down, which works okay for the characters but is a little disappointing considering some of the improvements we saw in Angel series 1. Above the waist, things are better. 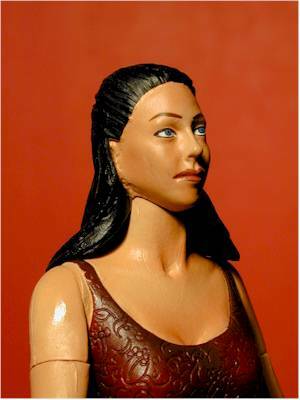 Dru has waist, wrists, elbows, cut joint biceps, shoulders and neck, although the neck is restricted by her hair sculpt. The Gents have neck, waist, shoulders, cut joint biceps, wrists and elbows, but the elbows are fairly restricted as well. As usual, this depends on where you buy them, but you should be able to pick them up for $12 each or so. At that price, Dru's an okay value, although if she had a better sculpt I'd give this a much better score. Her base is the best thing she has going for her. The Gentlemen are the best value yet in this MAC line. At $12 or so, you're getting basically TWO figures, a handful of neat accessories, and a great base. 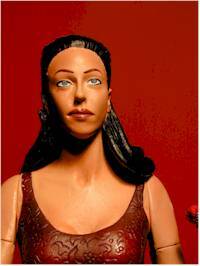 I'd skip this Drusilla, and go with the vampire look, since the photos of that sculpt looks much better. But don't pass up the Gentlemen if you're collecting some of this line. You'll need to buy both - MAC was pretty business savvy to put some of the important accessories with each figure, and the base really doesn't work well for only one - but they are well worth the money, and have passed up Spike as my favorite figures in the line so far. - Comics Infinity is where I picked my set up. As usual, they have great customer service. I had accidentally ordered two sets, forgetting the first pre-order. As they were filling the orders they noticed, and took the time to call me to double check before shipping them out. That's the type of service that keeps me coming back. They are $33.48 for the set of three, or you can buy Dru by herself for $11.16. 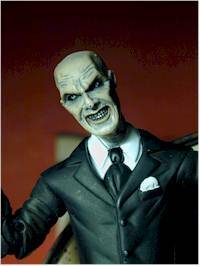 You can also preorder the Vamp Dru for $11.85. - Amok Time have the set of three figures for $30, plus shipping, a very good price, but I've never dealt with them directly.